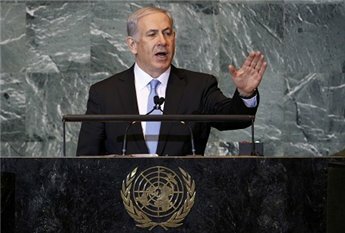 Israeli Prime Minister, Benjamin Netanyahu, delivered a speech to the UN General Assembly Friday evening shortly after the Palestinian President, Mahmoud Abbas, handed over the Palestinian UN membership application to the UN chief, Ban Ki-Moon, and delivering his speech to the UN General Assembly. Ladies and gentlemen, Israel has extended its hand in peace from the moment it was established 63 years ago. On behalf of Israel and the Jewish people, I extend that hand again today. I extend it to the people of Egypt and Jordan, with renewed friendship for neighbors with whom we have made peace. I extend it to the people of Turkey, with respect and good will. I extend it to the people of Libya and Tunisia, with admiration for those trying to build a democratic future. I extend it to the other peoples of North Africa and the Arabian Peninsula, with whom we want to forge a new beginning. I extend it to the people of Syria, Lebanon and Iran, with awe at the courage of those fighting brutal repression. Today I hope that the light of truth will shine, if only for a few minutes, in a hall that for too long has been a place of darkness for my country. So as Israel’s prime minister, I didn’t come here to win applause. I came here to speak the truth. (Cheers, applause.) The truth is — the truth is that Israel wants peace. The truth is that I want peace. The truth is that in the Middle East at all times, but especially during these turbulent days, peace must be anchored in security. The truth is that we cannot achieve peace through U.N. resolutions, but only through direct negotiations between the parties. The truth is that so far the Palestinians have refused to negotiate. The truth is that Israel wants peace with a Palestinian state, but the Palestinians want a state without peace. And the truth is you shouldn’t let that happen. Ladies and gentlemen, I continue to hope that President Abbas will be my partner in peace. I’ve worked hard to advance that peace. The day I came into office, I called for direct negotiations without preconditions. President Abbas didn’t respond. I outlined a vision of peace of two states for two peoples. He still didn’t respond. I removed hundreds of roadblocks and checkpoints, to ease freedom of movement in the Palestinian areas; this facilitated a fantastic growth in the Palestinian economy. But again — no response. I took the unprecedented step of freezing new buildings in the settlements for 10 months. No prime minister did that before, ever. (Scattered applause.) Once again — you applaud, but there was no response. No response. In two and a half years, we met in Jerusalem only once, even though my door has always been open to you. If you wish, I’ll come to Ramallah. Actually, I have a better suggestion. We’ve both just flown thousands of miles to New York. Now we’re in the same city. We’re in the same building. So let’s meet here today in the United Nations. (Applause.) Who’s there to stop us? What is there to stop us? If we genuinely want peace, what is there to stop us from meeting today and beginning peace negotiations?